The Bavarian Beerhunters is a 5 piece international band, whose members hail from Alaska, Texas, and Bavaria Germany. The band features a foot stomping, toe tapping, dance ‘til you drop blend of folk, honky-tonk and traditional music (Listen Now...). If you want to have a good time, kick up your heels and swing your gal, don’t miss The Bavarian Beerhunters, because they’re having a good time too. The FISHPICKERS, a 4 piece international band, whose members hail from Alaska, Texas, Bavaria Germany and most recently New Orleans. The band features a foot stomping, toe tapping, dance ‘til you drop blend of folk, honky-tonk and traditional music (Listen Now...). If you want to have a good time, kick up your heels and swing your gal, don’t miss the FISHPICKERS, because they’re having a good time too. "This is what live music is really all about. These guys have the spirit!" "People were knocked out by your live music performance, and lots of great comments about how uninhibited and free the music was." We were placed in the top 10 bands out of 350 bands from around the world at the 2009 International Buskers Festival in Ferrara, Italy. In the last 5 years The Beerhunters have mostly played in Southeast Alaska in the summers and in Bavaria, Germany in the winters. The Beerhunters are members of the California Bluegrass Association and The European Bluegrass Music Association. Just to let you know, The Bavarian Beerhunters were absolutely amazing last night. We loved them, the customers loved them! We asked them to come back and perform on Saturday so I think they’ll be back at least once. In the last 5 years The Fishpickers have mostly played in Southeast Alaska in the summers and in Bavaria, Germany in the winters. 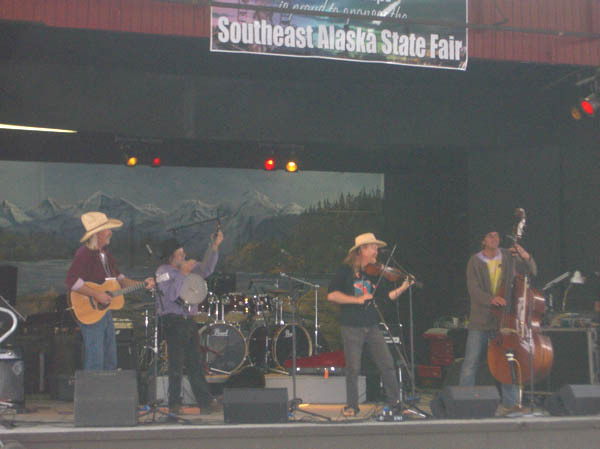 The Fishpickers are members of the California Bluegrass Association and The European Bluegrass Music Association. Just to let you know, the Fishpickers were absolutely amazing last night. We loved them, the customers loved them!